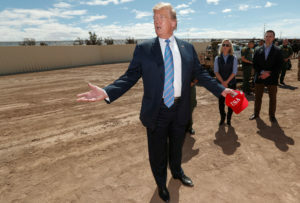 LAS VEGAS — Declaring “our country is full,” President Donald Trump on Friday insisted the U.S. immigration system was overburdened and illegal crossings must be stopped as he inspected a refurbished section of fencing at the Mexican border. Trump, making a renewed push for border security as a central campaign issue for his 2020 re-election, participated in a briefing on immigration and border security in Calexico before viewing a 2-mile (3.2-kilometer) see-through steel-slat barrier that was a long-planned replacement for an older barrier — and not new wall. As Air Force One touched down in the state, California and 19 other states that are suing Trump over his emergency declaration to build a border wall requested a court order to stop money from being diverted to fund the project. But Trump, who ratcheted up his hard-line immigration rhetoric in recent weeks, declared that his move, which included vetoing a congressional vote, was necessary. Also on Friday, House Democrats filed a lawsuit preventing Trump from spending more money than Congress has approved to erect barriers along the southwestern border. Congress approved just under $1.4 billion for work on border barricades. Trump has asserted he can use his powers as chief executive to transfer an additional $6.7 billion to wall construction. Trump, who earlier in the week threatened to shut down the border over the high numbers of migrants trying to enter the U.S., appeared to walk back his comments Thursday. He said Friday that it was because Mexico had gotten tougher in stopping an influx of immigrants from moving north. Trump, as he so often does, mixed fact with fiction when warning of the threat at the border. When complaining about the Flores legal settlement that governs treatment of migrant children and families, he blamed “Judge Flores, whoever you may be.” But Flores was an unaccompanied 15-year-old girl from El Salvador. He also downplayed the claims of people seeking asylum at the border, declaring without evidence that many are gang members while comparing some of their efforts to find safety in the U.S. to special counsel Robert Mueller’s investigation of Russian interference in the 2016 elections. As the president showed off the renovated section of the barrier to reporters, a balloon depicting Trump as a baby floated further down the border. And as Trump landed in California, the state’s governor ripped the president’s push for Congress to pass legislation that would tighten asylum rules to make it harder for people to qualify. “Since our founding, this country has been a place of refuge — a safe haven for people fleeing tyranny, oppression and violence. His words show a total disregard of the Constitution, our justice system, and what it means to be an American,” said Democratic Gov. Gavin Newsom. Trump has been increasingly exasperated at his inability to halt the swelling number of migrants entering the U.S., including thousands who have been released after arriving because border officials have no space for them. Arrests along the southern border have skyrocketed in recent months, and border agents were on track to make 100,000 arrests or denials of entry in March, a 12-year high. More than half of those are families with children, who require extra care. The southern border is nearly 2,000 miles (3,200 kilometers) long and already has about 650 miles (1,050 kilometers) of different types of barriers, including short vehicle barricades and tall steel fences that go up to 30 feet (9 meters) high. Most of the fencing was built during George W. Bush’s administration, and there have been updates and maintenance throughout other administrations. Trump has yet to complete any new mileage of fencing or other barriers anywhere on the border, though he declared Friday that at least 400 miles (650 kilometers) of the border barrier would be erected over the next two years. His administration so far has only replaced existing fencing. Construction for that small chunk of fencing cost about $18 million, began in February 2018 and was completed in October. Plans to replace that fence date back to 2009, during President Barack Obama’s tenure. Administration officials had been studying ways to minimize the economic impact of a potential border closure in case Trump went through with his threat, including keeping trucking lanes open or closing only certain ports. But even absent that extraordinary step, delays at border stations have been mounting after some 2,000 border officers were reassigned from checking vehicles to deal with migrant crowds. After the border visit, Trump traveled to Los Angeles for a pair of fundraisers in the deeply liberal city. He then traveled to Las Vegas for another re-election fundraiser and an address to the Republican Jewish Coalition, which is backed by GOP mega-donor Sheldon Adelson. Lemire reported from New York. Associated Press writers Jill Colvin and Alan Fram contributed to this report from Washington.